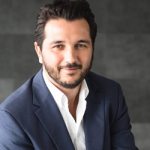 A graduate of HEC Paris, Youssef Chraibi started his entrepreneurial career in France at the age of 24 by co-founding Marketo.com, France’s leading B2B digital market place. Following the sale of the company to Vivendi, he carried out strategic consulting assignments in the telecoms and customer relations sectors. In 2003, he created Outsourcia, a group specializing in customer relationship management, digital and social media services, and business process outsourcing (BPO). The Group currently employs 500 people in Morocco and 300 in France, where Outsourcia acquired the French actor As-com and then set up a new production site in Evreux. The Group supports renowned clients such as Carrefour, Vente-Privée and GDF. In January 2010, Youssef Chraibi took over the presidency of the AMRC, the Moroccan Customer Relations Association, bringing together the major players in call centres and the BPO. He receives the first Medays Young Entrepreneurship Award 2010, awarded by Euromed and the International Trade Commission (a joint UN and WTO agency). The same year, Outsourcia was awarded by the World Organisation for International Property, the first prize of the Moroccan brand that is exported internationally.